During the night of January 7, 1943 Nikola Tesla died in his room at the Hotel New Yorker. The morning after the inventor's death, his nephew Sava Kosanovic hurried to his uncle's room at the Hotel New Yorker. He was an up-and-coming Yugoslav official with suspected connections to the communist party in his country. By the time he arrived, Tesla's body had already been removed, and Kosanovic´ suspected that someone had already gone through his uncle's effects. Technical papers were missing as well as a black notebook he knew Tesla kept—a notebook with several hundred pages, some of which were marked "Government." Several trunks of papers, records and equipment were removed from his room by the Department of Justice Alien Property Custodian Office. According to the controversial president of the FBI, J. Edgar Hoover, "they did not have any knowledge of the fact that the papers were photographed or that his men did such thing". The controversy of the "missing papers" begins by the fact that Tesla was already a citizen of the USA and for this reason this is a division of the U.S. government that should not even have authority or jurisdiction over Tesla's estate. According to the FBI, the papers were carefully analyzed by John G. Trump, a RADAR scientist at MIT, along with several high level Naval Intelligence officials. Trump declares that the papers do not contain any new information which would “constitute a hazard in unfriendly hands” and the papers are deemed safe to be released. Trump includes an analysis of Tesla’s particle beam papers in his report, concluding that the plans do not contain enough information to actually build a weapon and that any workable configuration would be of very limited power. Anyway today these papers are supposed to be in the Nikola Tesla Museum in Belgrade, Yugoslavia. When Tesla died in New York in January 1943, his papers—which were thought to include plans for a particle beam weapon, dubbed a “death ray” by the press—were temporarily seized by the Department of Justice Alien Property Custodian Office (“alien” in this case means “foreigner,” although Tesla was a U.S. citizen). Despite longstanding reports and rumors, the FBI was not involved in searching Tesla’s effects, and it never had possession of his papers or any microfilm that may have been made of those papers. Since 1943, we have told a consistent story to all who have asked. Reports to the contrary appear to be based on an initial confusion of FBI agents with other government officials—especially Alien Property Office personnel. These rumors have long been repeated in biographies and articles on Tesla without double-checking the facts as reported in our files. Articles in Tesla's hotel room after his death. 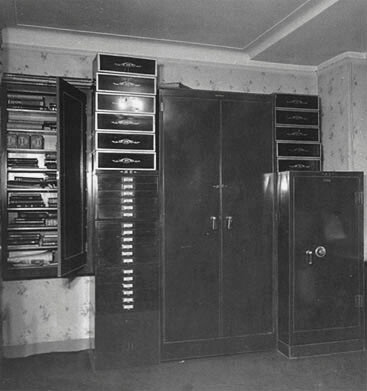 Note cabinets and one of the invertor's safes. Three packages of Nabisco crackers can be seen on one of the upper shelves of the cabinet at left. Tesla claimed that efforts had been made to steal the "death ray" invention saying his room had been entered and his papers had been scrutinized, but the thieves, or spies, left empty-handed. He said that there was no danger that his invention could be stolen for he had at no time committed any part of it to paper. The blueprint for the Teleforce weapon was all in his mind. In 1937, at his birthday press conference Tesla was asked about his weapon and made the claim, "But it is not an experiment... I have built, demonstrated and used it. Only a little time will pass before I can give it to the world." At the 1940 birthday press conference an 84 year old Tesla offered to develop his weapon for the US but there was no interest in his offer. There was an agreement dated in April 20, 1935 between Nikola Tesla and the Amtorg Trading corporation, as highlighted from the released unclassified FBI archives (Part 1 page 185). Contained within the extract Tesla agreed to supply plans, specification, and complete information on a method and apparatus for producing very small particles in a tube open to air, for increasing the charge of the particles to the full voltage of the high potential terminal, and for projecting the particles to a distances of a hundred miles or more. The maximum speed of the particles was specified as not less than 350 miles per second. The receipt of $25,000 fee for this disclosure was acknowledged by Nikola Tesla and by A. Bartanian of the Amtorg Trading Corporation. During World War II, Amtorg handled the flow of military supplies to the Soviet Union, including armaments, raw materials, food, and uniforms under the Lend-Lease program. During the Cold War years, the scope of Amtorg’s enterprise was more limited, but it continued to conduct its business at 49 West 37th Street, in New York City, maintaining a skeleton staff. As an arm of the Soviet state, Amtorg, at that time located at 355 Lexington Avenue in New York City, was targeted in two bombing attempts, in 1971 and 1976, by members of the Jewish Armed Resistance, an extremist group affiliated with the Jewish Defense League. Surrounded by continuing controversy, Amtorg survived the Cold War but did not survive the collapse of the Soviet Union, quietly disappearing in 1998.
hello! What is the source of the photograph shown in this article? is there an available hard copy of the released fbi vault tesla papers? Donald Trump might have all the answers, and is just using Tesla's name and discoveries for making money. Tesla's solar or free energy doesn't even mean what Musk is doing with the cars, as alien ETs aren't able to land here but he builds spaceships to go outside Earth's gravity, which is impossible. He does money with Tesla's name in order to finance that non-sense (and send a Tesla car to make fun of his name, and to mock off humankind) and take people's eyes on the sky, where Clinton prepares a holographic invasion which will induce a paranoia amongst the people who will witness it (probably US), therefore starting an alliance (Trump, Clinton, Musk, idk US politics so well, I'm from another jail called Europe) and start an imaginary war people will ask for (as they did after WTC) against holographic alien invasion, which will pour money inside SpaceX; people will buy even more Tesla cars. Who else sent through all media a 2D picture with a car and a astronaut ? Control the media - control the masses. Mass-media. Tesla stated that he had over 3 dozen inventions in one of his birthday conferences, and therefore must have had a large number of unapproved patents in his paper but, sadly they are still being kept in the national security research centre, what a pity we could have all the technology we've dreamed of if those patents were at least released!